Organic instant coffee substitute made from cereals. It contains no coffee beans and is therefore caffeine free. Organic instant coffee substitute can be enjoyed in the evening without risking sleeplessness. 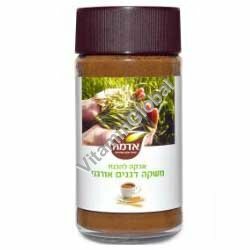 It is the ideal coffee substitute for people suffering from nervousness, high blood pressure or stomach problems. It is also suitable for children and pregnant woman. Ingredients: Organic barley (50%), Organic malt (30%), Roasted organic chicory (20%). Directions: Dissolve 1 teaspoonful of Bambu in a cup of hot water or milk and stir.